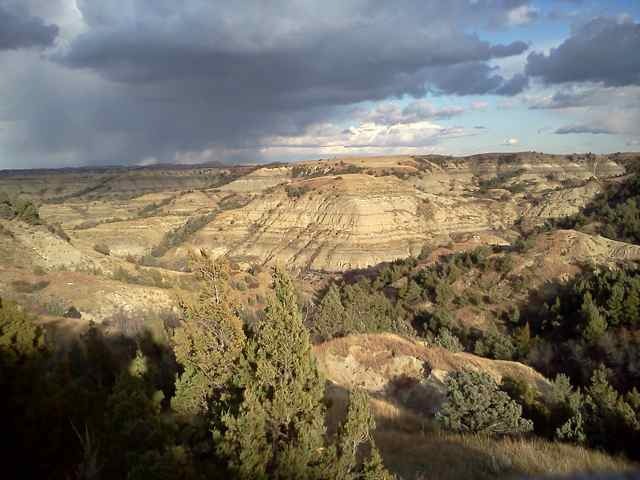 Here's a picture from our recent badlands trip. If you look closely you can imagine how challenging it can be to hike silently up and down through this landscape, how easy it is for mulies to sneak in under a shady spot and watch you coming from miles away. It is a starkly glorious place, one of my favorite retreats on earth. As an exercise in imagination, here's today's forecast for this landscape: "Cloudy with isolated snow showers in the morning...then partly sunny in the afternoon. Windy. Highs in the mid 30s. West winds 25 to 35 mph. Chance of snow 20 percent." Ouch. 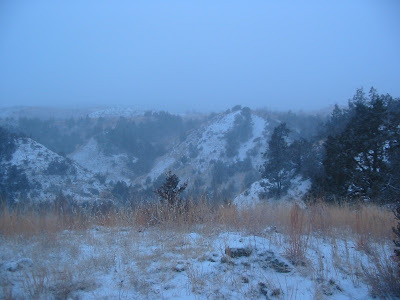 To help your imagination, here is a picture from the last day of our hunt in 2009, early in the morning after a snow. The temperature was in the low 20's and every surface took on a surreal kind of softness that was all illusion.